Study guide and exam simulator for the Adobe Certified Expert (ACE) exam. Is there a better alternative to Adobe Digital Publishing Suite ACE Exam Aid? Is Adobe Digital Publishing Suite ACE Exam Aid really the best app in Teaching Tools category? Will Adobe Digital Publishing Suite ACE Exam Aid work good on macOS 10.13.4? The Adobe Digital Publishing Suite ACE Exam Aid is specifically written in order to help you prepare for and to pass the corresponding Adobe Certified Expert (ACE) product proficiency certification exam. The exam aid is divided into Study, Practice, and Review modes, covers the topics recommended for study by Adobe, and contains multiple-choice questions, extended answers, and relevant hyperlinks to the application's Help pages. Version 11.0.2 [r.20130211]: Release notes were unavailable when this listing was updated. 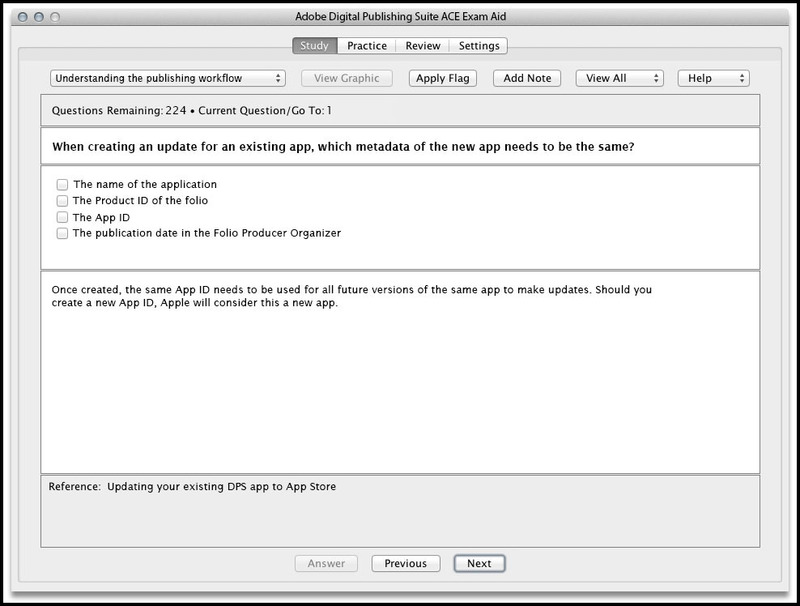 Adobe Digital Publishing Suite ACE Exam Aid needs a review. Be the first to review this app and get the discussion started! Adobe Digital Publishing Suite ACE Exam Aid needs a rating. Be the first to rate this app and get the discussion started!